At the Insurance Data Science conference, both Eric Novik and Paul-Christian Bürkner emphasised in their talks the value of thinking about the data generating process when building Bayesian statistical models. It is also a key step in Michael Betancourt’s Principled Bayesian Workflow. 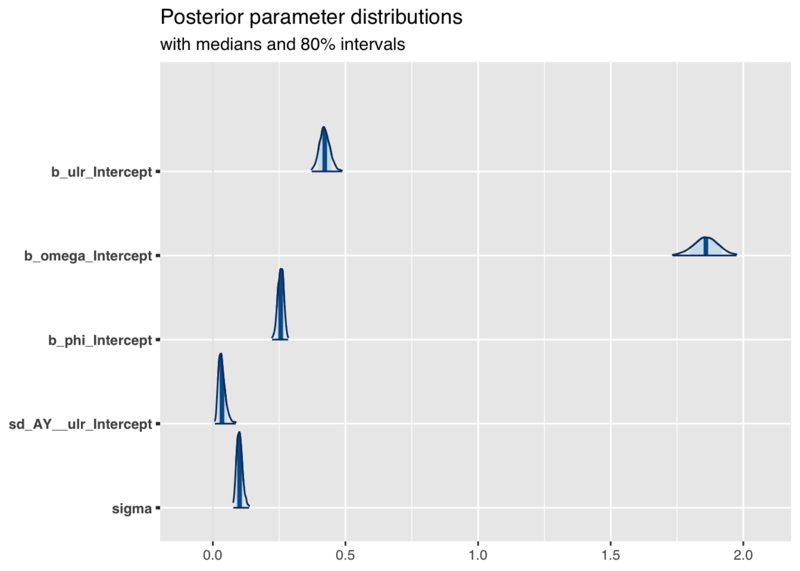 In this post, I will discuss in more detail how to set priors, and review the prior and posterior parameter distributions, but also the prior predictive distributions with brms (Bürkner (2017)). 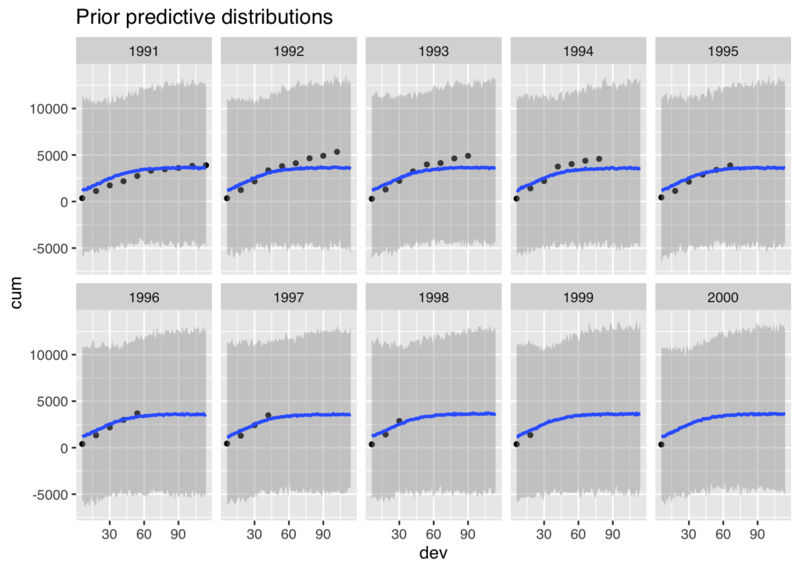 The prior predictive distribution shows me how the model behaves before I use my data. Thus, I can check if the model describes the data generating process reasonably well, before I go through the lengthy process of fitting the model. As an example, I will get back to the non-linear hierarchical growth curve model, which is also part of the brms package vignette on non-linear models. First I load the relevant packages and data set. 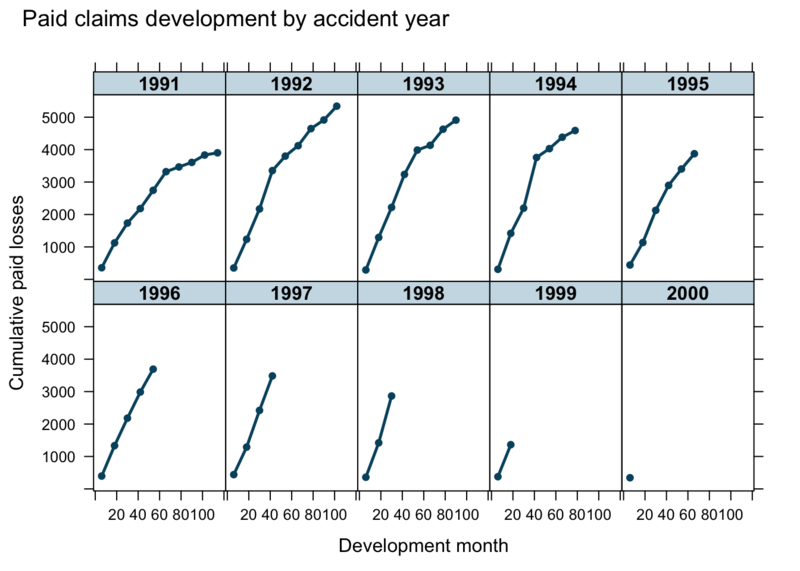 It is the aim to use growth curves to model the claims payments of insurance losses from different accident years (1991 - 2000) over time (development months) and predict future payments. I will start with the same model as in the brms vignette, but instead of fitting the model, I set the parameter sample_prior = "only" to generate samples from the prior predictive distribution only, i.e. 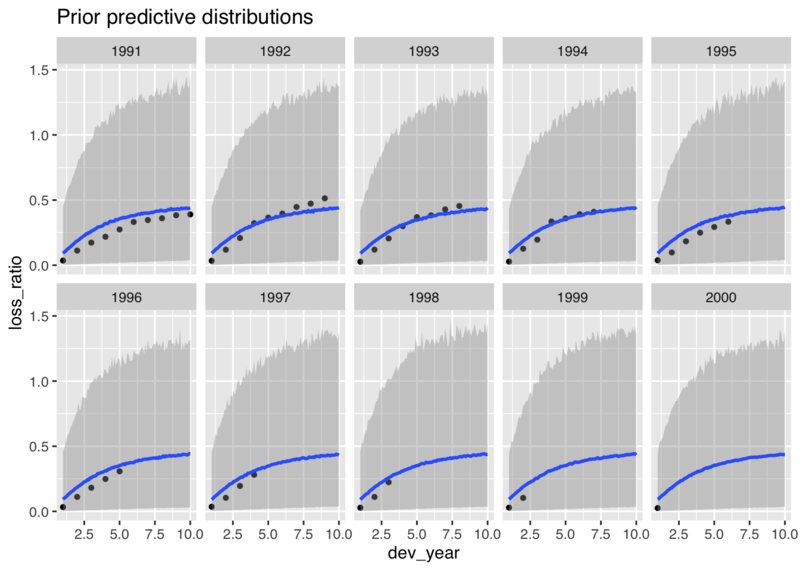 the data will be ignored and only the prior distributions will be used. I can use the same plots to review the prior predictive distribution as I would have done for the posterior predictive distribution. 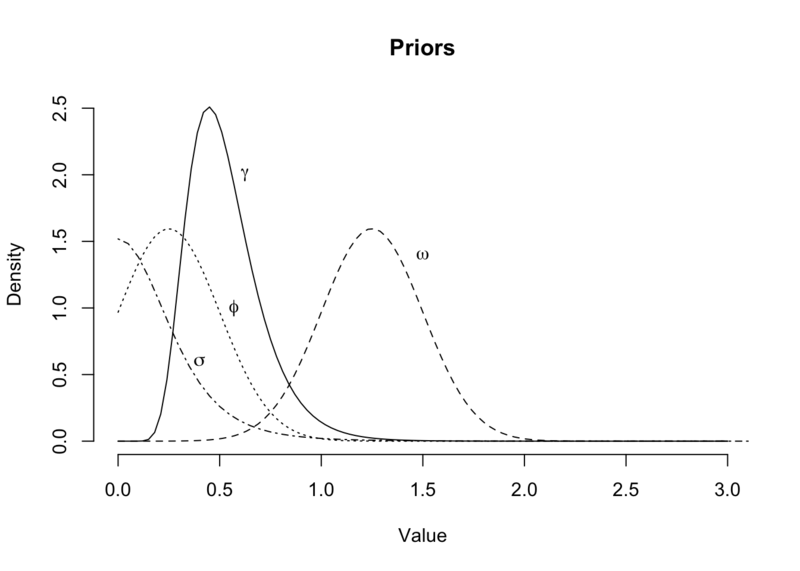 re_formula = NULL, method = "predict"
Perhaps this doesn’t look too bad, but the model generates also many negative claims payments, as I have assumed a Gaussian distribution. Yet, customers rarely pay claims back to the insurance company. In addition, this model simplifies the variance structure to a constant \(\sigma^2\). In (Guszcza (2008)) Jim Guszcza suggested a variance that is proportional to the claims amount. The code shows the default priors set by brm for sigma and sd_1, which I didn’t set explicitly. In addition, the last line shows the switch that turns off sampling from the posterior distributions. Use parameter \(\phi=1/\theta\), since I believe \(0< \phi < 1\). 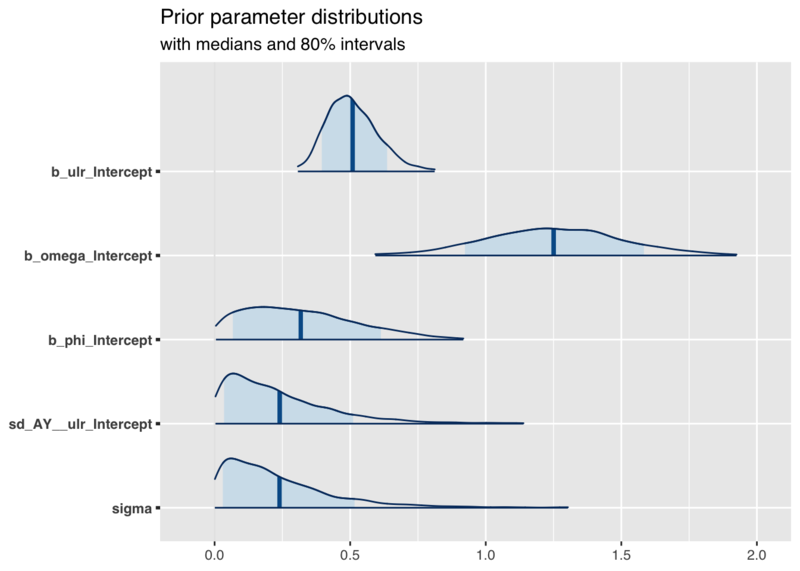 subtitle = "with medians and 80% intervals"
The prior parameter distributions look very similar to what I would expect, given the plot above. 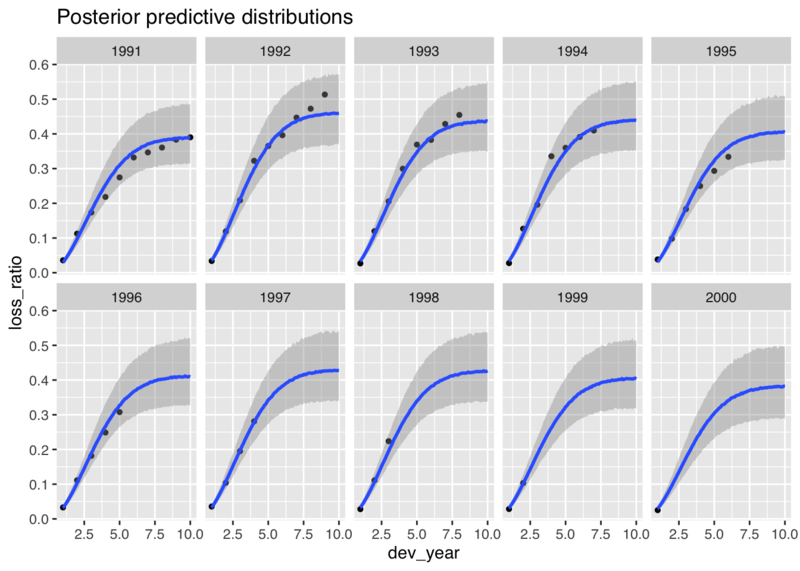 The prior predictive distributions look also more in line with the data. I am happy with the model as it is. In my next step, I start using the data to fit the model. To fit my model with the data I call update and set the parameter sample_prior="no". Note, the model doesn’t need to be recompiled. ## scale reduction factor on split chains (at convergence, Rhat = 1). The model looks well behave at a first glance. The plot looks good, but the model underestimates the claims development for the 1992 and 1993 accident years. Are those years and the data outliers? Should the model allow the parameters \(\omega\) and \(\theta\) to vary by year? Should I consider a different growth curve family? Tapping into expert knowledge can be invaluable. However, many domain knowledge experts will not be statisticians and will find it difficult to form an opinion on the ‘Greek’ model or the parameters. Yet, often experts will have a view on the data generated by the model. Showing them the output of the prior and posterior predictive distributions can be a lot more fruitful. And as I said earlier, don’t forget they are experts, and hence like/likely to disagree with the non-expert. Use this bias to your advantage! Bürkner, Paul-Christian. 2017. “brms: An R Package for Bayesian Multilevel Models Using Stan.” Journal of Statistical Software 80 (1): 1–28. https://doi.org/10.18637/jss.v080.i01. Guszcza, James. 2008. “Hierarchical Growth Curve Models for Loss Reserving.” In, 146–73. CAS Fall Forum; https://www.casact.org/pubs/forum/08fforum/7Guszcza.pdf.